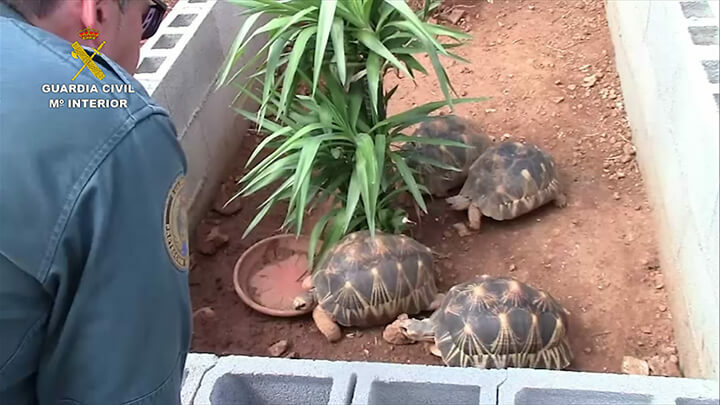 ‘Officers searched the farm and found that it was much bigger than expected and its aim was to breed at an industrial level different species of sea and land turtles,’ the police statement said. A ‘land turtle’ is more commonly called a tortoise in English. The farm near the town of Llucmajor in the south of the Mediterranean island was the ‘biggest illegal turtle farm in Europe’, it added. 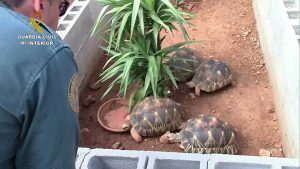 Police seized over 1,100 turtles and tortoises of 62 different species, including 14 of the world’s most endangered kinds such as the radiated tortoise from Madagascar, the Vietnamese pond turtle and the Chinese red-knecked turtle, as well as over 750 eggs, as part of their operation.